still and silent inside your hearts. In April, poems began to appear everywhere! from the ceiling, tips of noses, tops of heads. It was difficult to get any work done! let loose into the world. ©2010 Georgia Heard. All rights reserved. Georgia Heard is a poet, a teacher, and an incredible advocate for including the writing and reading of poetry in the classroom. For that work alone - and you can learn more about both her poetry and her work with educators in her Poetry Makers profile at The Miss Rumphius Effect - we should all give three cheers. (I'll pause here while you cheer. Thanks! ).We should also cheer for the collections she's put together, including This Place I Know - an amazing work made in response to 9/11 but which works for anyone, not just kids, seeking comfort. Finally, we should cheer for her poetry itself. Did I mention yet that I'm a sucker for poems about poetry? I should amend that, really: I like the poems of that ilk that fill me with joy, make me tingle, give me a new way to view something I love. Ars Poetica does all that - it makes poetry take wing - and makes me very happy, indeed. And you know what? 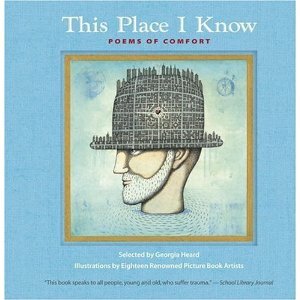 I'll give one extra cheer, just as I did when Georgia Heard said yes to being here as part of 30 Poets/30 Days. Yesterday brought us I Speak by Charles R. Smith, Jr. Tomorrow... Trying to Get Out of My Tree by George Ella Lyon! For more on 30 Poets/30 Days and ways to follow along, please click here. I love the idea of poetry as something that not only has seasons, but something that can be set free. I think I love poems about poetry now, too. Or maybe I just love good poetry? either way... love this one! That's poem pretty much tells what it's been like to write a poem a day this month! What a wonderful way to capture the birth and flight of a poem!